I first purchased the iGrill before weber bought the product. Everything worked perfectly back then. One day my own grill stopped working, and Weber knew of this problem and would not replace my iGrill. I reluctantly purchased another one thinking the build quality would’ve improved. Weber is a reputable name after all. This is the second time I’ve used the new device, and it cannot maintain connection via Bluetooth. I’m smoking a brisket which can take upwards of 16 hours, I’m four hours in and I’ve had to reset the device four times so far. I own an Android device as well as an iPhone and the problem exists with both phones. If you’re reading these reviews to consider purchasing this device, I would strongly advise against it. Great! But wish there was a library/journal to keep previous grills to record them & look back on. So much better! Great updates! So few months ago i would have never suggested the igrill to a friend because the app was so bad. With recent updates and tweaks it is soooo much better!! I can quickly select the type of food, how i want it cooked and what plug it is in. It flows great and is so easy to do! Great work on the updates! Keep up the great work! My only wish is you could save the graphs of the cook temps. The prevent screen sleep mode does not work. Phone constantly goes to sleep. I have to unlock every time I want to see temps. Turning notifications off doesn’t work. I keep getting notifications every time the temp fluctuates in and out of range. No way to name the probes. Can only change the color. There are better temp monitors and apps out there. If i could return this, I would. Very disappointed. I have a thermapen that I swear by. I’ve owned it for about a year, and it cane lab calibrated with a certificate of accuracy. I’ve found my iGrill 3 to be nowhere near the thermapen in terms of accuracy. Will a calibration feature be added? The app claims I have to update the app every time I open it. It forces me to the App Store where it says it is up to date and finally allows me to go to my temps. Crummy. It didn’t do this until the last update. This is the second unit I have owned. The first lasted about a year before it gave incorrect readings, my second began doing it on the second cooking. Right now sitting on the counter, it reads 205 degrees before I have even began cooking it. I will not be buying a third. Buy another brand. Why can’t I just type in the temp settings? Please add the ability to mute or turn off the alert sound when the food close to or at temp. I really like the app, but my dogs hate it. Latest update caused the igrill to beep notifications even though alerts were dismissed in the iPhone app and the app is closed. Also the blue light for the on button no longer stays on. Only when pressed. Will update review when fixed. I bought the I-Grill 2 and love it but the app is missing one thing. It needs to have a high/low temp range setting for the probes. My Ambient Probe would be so much better when I am smoking food if I could set a range say 225-250 and get a warning when it gets high or low instead of just inputting one temp for high. I hope you guys listen to this. I bought my iGrill 3 a year ago and it’s been worthless. It disconnected after 30s every time and I had to reboot it. Now it’s working and sending notifications. Really happy with this app now. Quite simply the tool works as stated by Weber. 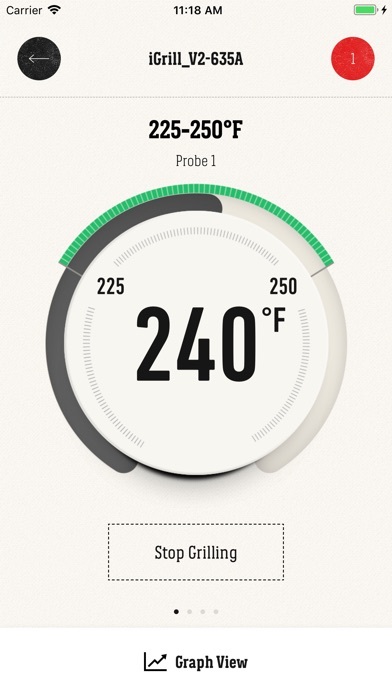 The food temperature is monitored through the iWeber app and your cell phone. I did learn two tricks. 1) insert the probe through the side of the meat, half the thickness location. 2) flip the meat just before the half temperature required max I’m now a pro! I used to be able to set the temperature at 204F for my brisket and pulled pork. After this last update, the highest I can set it is 200F. I love these probes, but this is very frustrating. Like most of you, I have quite a few apps that work well but have never taken the time to review. But WOW! This device and app have truly impressed me! I’m using it right now smoking a brisket and monitoring the smoke box temp. I have it dialed in for a temp range and have been in the pool all day. It notifies me on my watch when temp gets out of range and I make a small adjustment and all is good. Technology is so impressive! Way to go Weber! I have to say I’ve also been reading through the reviews and seen Weber’s responses to comments. Great product and great customer service. That’s about all you can ask for from a company! Temperature and connectivity is unreliable. WiFi makes so much more sense. I could then leave a brisket and monitor from anywhere remotely, not just steps from the smoker. Only complaint. Otherwise great tool. First time I’ve ever cooked a bunch of chicken breasts to perfection without opening lid and cutting chicken open! Glad you have a Apple Watch app but please add complication so I have it at a quick glance on my watch face! They Screwed it Up Again! Once again, Weber has “upgraded” their App only to make it worse than it was before. It gets woe-rise and worse with every change they make. I guess the people who create code never use these things. You can no longer set your meat temp above 200 degrees — any pro will tell you that 203 to 205 degrees is the magic number for many slow cooked meats. Also, they have tried to make it so you can change the color markers of your probes in the App, which you can do, but after a little while, the colors go back to the default settings. 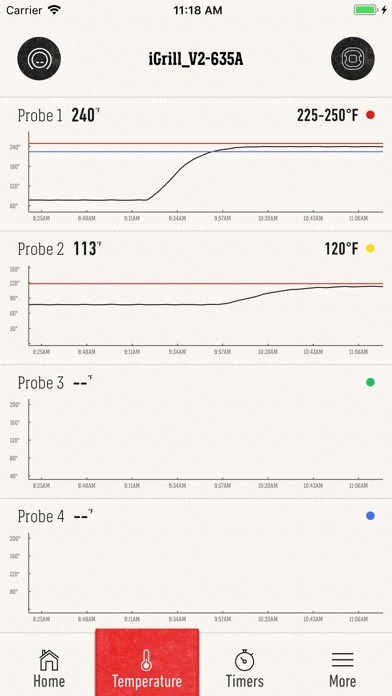 How can you keep track of temps for different probes when the probe colors keep changing? 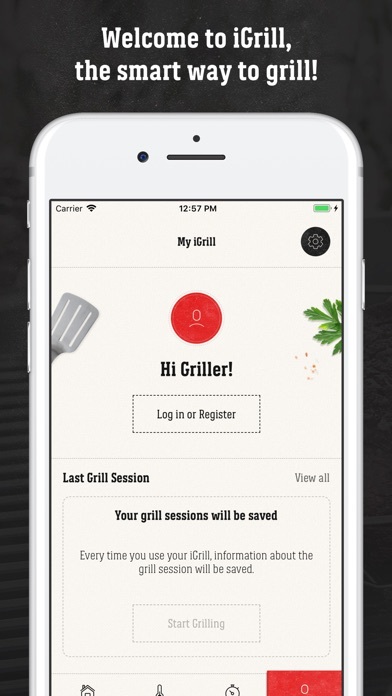 Why didn’t Weber just leave this App alone when they acquired iGrill? It was so much better befor it became a Weber product. There are too many other problems with this App for me to list and waste my time on. When is Weber going to get it right? Update making connecting to Bluetooth difficult (I have an iPhone X). Can’t pick the alarm sound anymore, the only option is negligible relative to what I had previously setup. Also for certain cooking I need the temperature to go past 200 degrees, but your manual setting won’t allow for it. Not the end of the world, but I am shaking my head wondering how in the world you screwed this up? 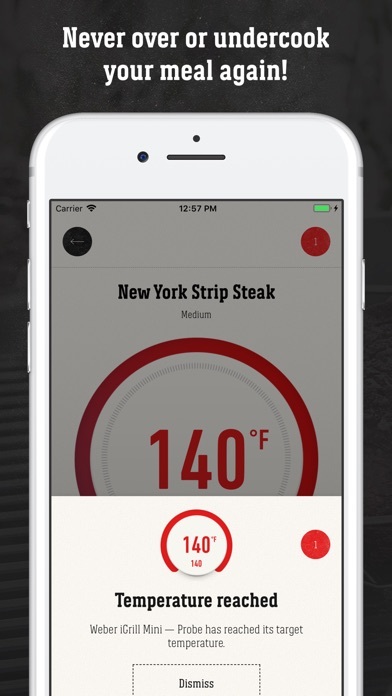 The app is nice and really easy to use great if you’re roasting something on the grill and want to be able to maintain a consistent ambient temperature. While also monitoring the internal temperature of whatever you’re cooking. The only real issue that I have is the ambient sensor I’ve got mine set up on a gas grill and temperatures on the grill can exceed the maximum capacity of the ambient probe they should use a different type thermocouple with a higher heat range and allow that to be programmed within the app to read the correct temperature. Your supposed improvements were all smoke and mirrors. Still don’t have the song alert capacity.Still can only set temps in 10 degree adjustments.Still awful beep sound.You guys ruined this app when you bought this company and changed it.Lots of window dressing, with no substance. Like many an update rendered my older igrill useless. However, after contacting support they did send me an updated model that does work with the newer programs. I do miss the features of the old igrill software, but overall am happy. I will say my connection is more stable now than it was with the prior unit. Always loses connection, even when within 10'. Even went through checking my phones settings and no help. Jus not a good app. *developer notes don't help, same reset this disconnect that that has been tried 20 times before rating this. It's just not good software. We grill and smoke year round. This Weber and my wireless grilling tools make It easy. Updates over time have corrected some of the issues I had with Weber’s iGrill. The biggest being the app can now be used in landscape maps de without turning your head sideways. Thank you, Weber. This app works great as long as my phone is within 15-20 feet of the receiver. Once it disconnects, I have yet to have it reconnect unless I shut off the thermometer and get my phone right next to it. My only gripe is the strength of the Bluetooth. Otherwise, great app and product for the price. Rendered my iGrill2 useless. Thanks alot Weber. I used to love my iGrill2 and used it a lot, but since the Weber takeover I've had nothing but issues. Now the app will no longer connect to it. Seems to be a common issue. Now I have a $100 paperweight rather than a working iGrill. I have 3 Weber grills so usually a fan, but this is a big disappointment. I love the iGrill. The unit I have is the mini version. I only wish Weber would come out with a two probe version. Having the iGrill has totally changed my smoking for the way better. But please a two probe version. The measurements are not accurate at all. You can literally have 3 probes giving you 3 different temperatures in the exact same location. Many times by a difference of 10 degrees. Which one to trust? What chicken do you serve, undercooked or dry? I’ve called customer service and replaced the probes many times (at my expense). If you’re looking to nail a perfect temperature on a $100 Prime Rib, don’t use this thermometer. This is a fantastic app to monitor your foods temperature as you cook. The temperature graph is extremely useful especially when using an ambient probe. My only gripe is that the main unit is Bluetooth only. While it works, the range is extremely limited. That’s a due to the limits of Bluetooth technology, not the product itself. I I’ll continue to use the iGrill2 for every cook until a WiFi version is released. Great app, but watch app needs fixing. Very happy with the app & probes. Food just comes out much better now. We use it indoors & out, convection baking, grilling & smoking. Sadly, the watch app fails to see any probes & it also needs a Complication to show the current probe temp at a glance. Easy to use and makes me seem like a good cook. Setting the target temperature for the grill is not clear. I have to try several different things to finally get it set correctly. For something as basic is this it should be trivial. Edit: got it working again. Thanks! Found out a little late that my trusty temperature probe igrill is no longer supported by the new Weber app. Why would anyone spend more money on a new product if it is just going to be obsoleted in a future app update? I'll try the reset by holding - + as mentioned. Maybe worth adding a note in the app if connection times out. I still hate the app after the upgrade. I don’t have any connection problems or alert problems like some other reviewers but the basic usability and display is awful. Specifically when you select what you are cooking; steak for instance, it presents a list of probably 100 different types of steak which you then have to scroll through. Seriously??? I just want to grill a basic slab of meat to medium rare I don't give a crap if it’s top sirloin or ribeye. The temps are exactly the same. Then when looking at the graph, it is squeezed into the top quarter of the screen- I can tell one of their products has 4 temp sensors so it makes sense to show all 4 but I have the igrill mini with exactly one sensor. I used to see a full screen graph where it was very clear. I know these apps are expensive to build; so it is baffling to me why they would rebuild what was previously a great design and replace it with this very pretty but useless crap. The original version of this app was very clean, simple and intuitive. Since the Weber label has appeared, it took a big step backwards, but has been getting better. The main reason for 4 out of 5 now is due to the following: 1. The original app had a much more limited list of food selections, which made the app much easier to use. Given that the target temp for most in a category are the same, it’s much easier to just have the exceptions, or maybe just a range slider. 2. Missing feature: estimated time to done. Otherwise, the app and associated device has worked great. It has al the features and convenience to make it worth the cost but it simply does not stayed paired and I’ve had the issues with multiple iPhones and multiple software versions. Fix the connectivity and it’s worth it - until then avoid. Got the Weber iGrill mini for a Christmas present. Already own two meat temperature sensor systems that have built in radio transmitters for their remotes. With those units I can sit in my living room and see how my cooking is going out on the patio a couple of hundred feet away. In contrast, the iGrill transmits using Bluetooth. The connection is lost if I’m more than about 20 feet from the grill, which invalidates the whole concept of remote sensing. If I’m that close to the grill I’m not going to pull out my phone to check the meat. The iGrill goes in the drawer where I put things I’m pretty sure I’m not going to use but that are too nice to throw in the trash. My beer drinking buddy let’s me know when it’s time to go check on things. Takes all the guess work out of cooking. Allows you to relax and do other things when cooking big meals. Great devise for the money. We had a cook out today for our Christmas dinner. It was the second time I used my 6 burner Weber grill and the first time I used the igrill thermometer. Used it to cook steak, chicken and salmon. All 3 turned out PERFECT! Thank you Weber. Good system, double probes. Only problem is the unchangeable pitch which my 65+ year old ears refuse to hear. I get so sick of coming back in the house from my smoker and iweber starts oinking at me that I’ve lost connection. I may as well be outside with my Thermapen. Increible product, please add AppleTV to mix too! I thought this would be a great tool to help me when smoking. However every time I paired it, next to it, 3ft away, 6ft, 10ft, 15ft, didn’t matter how close or far, the thing always lost signal, or unable to stay connected. I spent more time reconnecting then actually using it. I took the batteries out and deleted the Bluetooth pair and then reinstalled it, still horrible at staying connected. It needs to be re-engineered or the app needs to be revamped. Needless to say I’ll probably get rid of it if the problem continues as I’ll be completely frustrated. Might just get an old school thermometer vs using this. Please fix or it’s finding a home in the trash. I had a great experience with a customer representative from iGrill. Very nice to know they support and service what they sell. Great device for getting your grilling done right! My friend bought this for me and I thought it was gimmicky, then I tried it out and BAM! It hit me, this is great and a great timesaver. I don't have to go and check on my cooking near as often. I love it! They really work great. They are easy to use and the presets and temperatures are easy to set. The only way to improve this as far as I can tell is to make the temperature and doneness a little more evident. My wife likes well done which typically means very little pink if any. But this typically leaves more pink and some red...what I would call medium. Maybe label temps with a picture of what the meat looks like? Many of the items mentioned in the user manual don’t appear in my app. Without custom settings for alarms, etc., not much more useful than a meat thermometer. Sorry I spent the money. I just cooked the best steaks of my life using this app!! I love it! Makes you a great cook. Concentrate on the recipe.. the temperature is no worry! Update on my review. The Bluetooth is so bad on this. I’ve upgraded to a new iPhone8, horrible. I have it on an android tablet, horrible. The Bluetooth is just so weak. I’m constantly having to forget the device, find it again, turn the unit on/off.... I thought it might be my house, but I don’t think it is. I have a Bose Bluetooth speaker and my phone connects to it while I’m pulling into my driveway, regardless of where the speaker is. I wish I would have just saved my money and waited for something better. My dad bought one while visiting a while back. Tried his out of the box. Same issues. Walk 10+ feet away and connection is lost. He took it back and got a refund. I have a lot of solid Weber products and I still stand by them, just not this particular item. Original review below: This app works great as long as my phone is within 15-20 feet of the receiver. Once it disconnects, I have yet to have it reconnect unless I shut off the thermometer and get my phone right next to it. My only gripe is the strength of the Bluetooth. Otherwise, great app and product for the price. When the app works, it’s nice. But, it constantly drops the connection to the transmitter. I’m about 25’ away from the unit and it drops repeatedly. 1. Bluetooth is useless for communicating; 10’ range? May as well just stand next to the transmitter and watch. 2. No way to set high/low thresholds for alarm events. 3. Can’t view multiple temp at the same time. 4. Stand-off for monitoring grill temp (critical for cooking low and slow). 5. Temp off by 2 degrees from probe to probe. Ridiculous! Really surprised. Haven’t questioned the Weber brand before. Very disappointed! The app has improved over the last few years. My biggest complaint are the fonts on the diagram screen. It is difficult to see the time and temperature on the graph. It would be good if they were increased or could be zoomed with two fingers. The hardware works well for cooking. The color codes all turn black after a few barbecues. Keep a set of pliers around to remove the probes or you will burn your hands. Helps me measure grill temps and food temps enough to where I am better equipped to control flames/smoke. Well done! I am a Gas/Charcoal/Wood Griller/Smoker, depending on the cut and recipe. The Weber iGrill app is one of my most used and favorite apps. It always function with my iGrill mini thermometer and helps me to smoke the perfect rack of ribs everytime. The app looks good and when it works does everything I need. That said, it disconnects from my iPhone 8 Plus every 30 minutes or so and will not reconnect unless I turn the igrill unit on and off again. I tried to hard reset the unit as well and I’m still having the same issue. Really takes away from the functionality of the device if I can not walk away on a long smoke for example. Blue button still does not stay lit to illustrate device is on. Nor does app screen stay on even if enabled within the app’s settings. Please fix. Thank you. Your thermometer is great. Your App is a complete JOKE. FIX THE CONNECTIVITY ISSUES. I will be moving on from this piece of garbage soon. Another summer of “Lost Connectivity, Reconnecting” has done me in. Goodbye. My only issue is in the option to set a custom temperature. The rotating adjustable wheel is fine except just a bit too sensitive. Difficult for those of us with big hands to set exactly; tends to jump forwards or backwards 1-2 degrees on release. I have the four probe unit. I usually only use one or two probes in the thickest meat and that works perfect. I use to alway BBQ by touch. Now cooking by temperature is 100% easier and perfect every time. Plus I can hang out with my guests and my phone alerts me when the meat is ready to come off the grill. I like to cook pork shoulders to 200 - 210 degrees; presets don’t allow it. WiFi continues to disconnect from the app on my IPhone. Unless I’m within 20 ft of the grill. One of best items I ever purchased. Makes cooking so easy. It’s very accurate, food comes out perfectly cooked. I do not trust this product. It does not measure temp properly and is typically about 10 degrees off or so. It also continually disconnects from Bluetooth. The phone is never more than 50ft away from the iGrill and it disconnects and then cannot reconnect unless I turn the unit on and off. Even if I forget the device in my Bluetooth settings it still doesn’t reconnect. I plan on trying a different product from thermoworks. Please work on the “lost connection”. I have my phone sitting next to the unit and it drops connection over and over. Using the “Mini”, the temp graph is so light and small, that nobody could make out what it was showing. Therefore the graph is useless and your stuck with the small Ball temp display that only shows at the top of the page. We can’t seem to get any Pre- Notifications when temp is 10 degrees below the target temp. The overall visual is useless in outdoor light on the iPhone X at full brightness. I wanted to set an alarm to monitor my turkey brine, to ensure it doesn’t rise above 40° while the bird skinny-dips. My old non-connected thermometer had no problem with this. 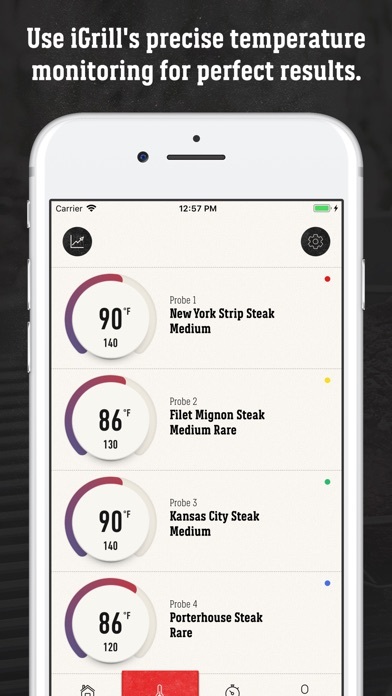 Unfortunately the iGrill app (used with the iDevices kitchen thermometer) enforces a minimum alert temp for “food” mode of 70° and for “grill” mode of 50°. Come on now! Give me some way to get an alert for lower temperatures! They render just fine in the app; I just can’t alert on them. Awesome addition to the grilling Arsenal! This was a Father’s Day gift from my daughter. It works great on my Weber Genesis 4. For temperature sensitive meats, it is awesome. My phone alarms when the meat is perfect! It doesn’t show the proper probe temperature sometimes. Have to disconnect and connect to get it to show right temperature. But other than that it’s ok. This product was a waste of money and I hate it. So overall as a instant temp for right now, the app works. However given you have historic data you’re collecting, a simple little math can come up with an estimated time for completion to cook something. To me this is a very easy feature but one that is sorely missing. I use this to monitor temps while I smoke my meat and by adding a feature that looks at the trend of temps and the last few polls, it can easily put in a “estimated grill done temp” which would be awesome. All it would need to do is display it somewhere with the done temp and could even be a view within the graph to swipe to the right side so you can see the path of the temp change as you adjust the temp of your grill or smoker as it will modify the end cook time as well. This one feature alone makes my old $15 thermometer far better as it could do that. Works as advertised, very handy. I am enjoying using my iGrille 2. 4 meals and it works as described. The Bluetooth could be a little stronger. I walk about 12 paces from the grille and loose connection. I walk back about 4 paces and there it is. I have not used multiple probes yet. Another good product from Weber. The app is not responsive half the time,and once you leave line of site of your grill the signal drops. Really should run on WiFi or have a device to run Bluetooth over WiFi. This app went from 1 star average review to near 5. It’s clear that Weber cares about the quality of this app. Perhaps not the top-notch quality of their hardware, but it’s getting there. The BEST grilling tool I have ever used! I use with a Traeger and a Big Green Egg, never a problem. Anyone with a grill should own this tool. The “graph” view is neat, but why not add an estimated countdown timer to target temp based on the temperature trend? That would be sweet! I’m frustrated that the app sends me two sets of four alerts in succession when the target temperature is almost reached. One would be fine with me, not eight. If I could customize the notifications I wouldn’t have to disable them for this reason. Second, why can’t I adjust my target temperature above the recipe-specific temperature? Otherwise, I love the app and appreciate having the ability to monitor internal temperatures over Bluetooth. Had to replace battery four days after first use seems unit will not turn off. Have to remove battery after each use. Not sure if defective or not as manual says nothing about turning off. I have a tendency to drink a beer or two and socialize while grilling. This sometimes leads to well done food. The grill saves my bbq! App is great. Just wipe off probes. Don’t ever soak in water or you’ll be buying new probes. This is one of the best inventions ever. Having cocktails and loose track of time is no longer an issue. Always the perfect temp. This is the most awesome device I have bought. It makes you not have to do anything with your meat. No opening and closing the grill and poking the meat. Just watch the temperatures and when they get to 120 turn it off ...make life simple.... life changing device! The feature that allows your phone screen to stay on is not working properly. I have reset it several times to on position and screen still shuts off. Please fix this. I own an original iDevices iGrill thermometer. While I do not use it frequently, when I need it, it is a very handy device. Unfortunately, I have recently been forced to upgrade from the iDevices app to the Weber iGrill app and now my iGrill thermometer will no longer pair with my phone. I called customer service. While very friendly, their answer to my issue was that my device is obsolete and not supported by the Weber app and I need to buy a new Weber iGrill thermometer. This doesn’t feel like a reasonable answer when my device functioned just fine except that Weber decided to no longer support legacy iDevices devices from the product they purchased the rights to. Feels like they are trying to force users to scrap their old functioning devices in order to drive sales of Weber branded products.